Tests using advanced technology could resolve a longstanding puzzle over what is driving the accelerated expansion of the Universe. Researchers have long sought to determine how the Universe's accelerated expansion is being driven. Calculations in a new study could help to explain whether dark energy- as required by Einstein's theory of general relativity - or a revised theory of gravity are responsible. 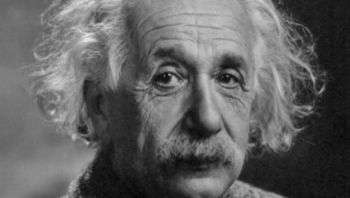 Einstein's theory, which describes gravity as distortions of space and time, included a mathematical element known as a Cosmological Constant. Einstein originally introduced it to explain a static universe, but discarded his mathematical factor as a blunder after it was discovered that our Universe is expanding. Research carried out two decades ago, however, showed that this expansion is accelerating, which suggests that Einstein's Constant may still have a part to play in accounting for dark energy. Without dark energy, the acceleration implies a failure of Einstein's theory of gravity across the largest distances in our Universe. Scientists from the University of Edinburgh have discovered that the puzzle could be resolved by determining the speed of gravity in the cosmos from a study of gravitational waves -space-time ripples propagating through the universe. The researchers' calculations show that if gravitational waves are found to travel at the speed of light, this would rule out alternative gravity theories, with no dark energy, in support of Einstein's Cosmological Constant. If however, their speed differs from that of light, then Einstein's theory must be revised. Such an experiment could be carried out by the Laser Interferometer Gravitational-Wave Observatory (LIGO) in the US, whose twin detectors, 2000 miles apart, directly detected gravitational waves for the first time in 2015. Experiments at the facilities planned for this year could resolve the question in time for the 100th anniversary of Einstein's Constant. The study, published in Physics Letters B, was supported by the UK Science Technology Facilities Council, the Swiss National Science Foundation, and the Portuguese Foundation of Science and Technology. Dr Lucas Lombriser, of the University of Edinburgh's School of Physics and Astronomy, said: "Recent direct gravitational wave detection has opened up a new observational window to our Universe. Our results give an impression of how this will guide us in solving one of the most fundamental problems in physics." "Scientists from the University of Edinburgh have discovered that the puzzle could be resolved by determining the speed of gravity in the cosmos from a study of gravitational waves -space-time ripples propagating through the universe." Important difference between the speed of gravity and the speed of gravitational waves. Newtonian gravity is instantaneous because the gravitational fields of the gravitating bodies follow right along with the bodies. @Seek 'Newtonian gravity is instantaneous' Yeah- so is Newtonian EM! We've all got a little further than that! Do try to keep up and stop staring out the window. Gravity does not distort space/time linearly, except at the very first instant, the very center instant and the very last, because the "gravity well" is in motion at a different momentum relative to that space/time. Kind of a de-connect, to reconnect. Could well show a "bow-wave" effect. Static fields are there waiting on you when you get there. It's not like turning on the switch and waiting for the light to come on. Gravity has momentum? Just checking. It's a field generated by matter (which, in almost all cases, has differing momentum within space/time). Static gravitational fields don't logically imply gravity is instantaneous and doesn't travel at the speed of light. The solar constant is also like a static field in the very narrow sense it is fairly constant. Does that imply light from the Sun is instantaneous and doesn't travel at the speed of light? -point; don't gravitons travel at the speed of light? Why would they be the exception to the rule? Static gravitational fields are there waiting on you as soon as you get there. How can light not travel at the speed of light? Gravitons propagate gravitational radiation, not gravitational fields.Actually per Erik Verlinde gravitons are really phonons. Could be but so would your clocks so you would never know. Maybe light just loses energy over time, which would lengthen its wavelength. Numerous processes in space could accomplish this, such as refraction, absorption, gravitational lensing, dispersion, etc. No expansion required. Maybe light just loses energy over time, which would lengthen its wavelength. Tired light hypothesis. Look it up. Doesn't work (even its inventor came to the conclusion). Although gravity waves do move at the speed of light in a vacuum, much of the universe is not a vacuum. Therefore, this problem is not as simple as has been assumed. Some 80 percent of the universe is made of hydrogen, so the first approach would be to determine the effect of hydrogen. Which is about 6 atoms per cubic meter. It's inventor never saw the CMB did he? He knew about spectroscopy. If tired light were true spectroscopic lines wouldn't be shifted, They are shifted. Hence: tired light doesn't work. Whatever happened to the tired light theory? It didn't agree with observation. There's a name for theories that don't agree with observation: Failed theories. at least the DE. It seems to be everywhere. Like a gas station everywhere you go. Numerous processes in space could accomplish this, such as refraction, absorption, gravitational lensing, dispersion, etc. Therefore, these will not change the true speed of light in a vacuum. Photons travelling between 2 electrons is at the true speed of light in a vacuum. I actually believe many scientists would think that same thing if the evidence supporting anything else could be shown with any sufficient verity. Doesn't mean that they aren't actively pursuing other potentials. That's what science is. I believe the disconnect is in how one views the mechanism of speed of light. At it's very core (kinda like electricity), it is photon (energy packet) xchange between mass bodies. This exchange is what actually occurs at C. Only the frequency at witch it "rotates" is is diminished as a result of a new larger number of photons now travelling together. At it's very core (kinda like electricity), it is photon (energy packet) xchange between mass bodies. This exchange is what actually occurs at C.
So no mass no exchange no photons no light. Interesting. Mass being a measure of velocity of motion, yes... And also, it happens on a scale we are not yet technologically sufficient to see... And that velocity a derivative of kinetic "charge" (spin). Bear with me, still trying to figure out what might cause the initial photon to start the reaction... The fact that they all work in concert is what's puzzling... SOMEthing had to go first. There being a distinction between growth and expansion. Spacetime feeds off the dark energy so the growth is exponential and the growth rate is the cosmological constant. So it appears today but in the early universe spacetime was compressed so it did expand as it cooled. The distinction being as it grows it maintains a constant temperature as long as the dark energy density remains constant. An interesting and intractable problem when you only have two gravitational wave observatories; trivial when you have three. If you think about it you'll see why. Replace all references of "gravitational waves" to "shock waves". Now picture gravity as analogous to the silk strands of a spider web. Pull one node on the perimeter of that web and the entire web accommodates the stress placed on it immediately. Now consider the web as universal in scope, and the light from that node (star) taking millions of years to get to that node's opposite perimeter. Calculations of dark matter are done by plotting celestial bodies' motion over time. Now, those stars are definitely not where they appear to be at the present time, but their gravitational influence interacts with the other celestial bodies in real time. Astronomers are basing their DM conclusions on calculations that are actually based on this instantaneous behavior of gravity via this snapshot process, but continue to describe "gravity waves" and DM in the context of "gravity at the speed of light". Big conundrum.